Already decided and you know you want to surprise everyone with a wedding whose characteristic colors are white and black, is all set, decoration, cake and every detail imaginable, but if you really want your celebration an unforgettable can do it using the right dress. How about a white one with black accents or black with white? Original, isn't it?, because here are some interesting alternatives. 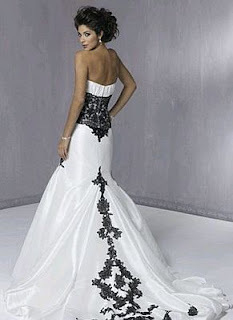 Strapless white wedding gown with wide and long tie belt in black. 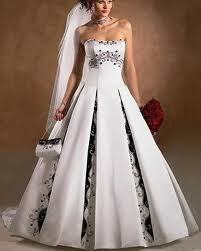 White wedding dress with straps, full skirt and long tail with bow and embroidered applique at the base in black. Beautiful pattern of white wedding dress, strapless and form-fitting in mermaid cut, worn under the bust and at the bottom of the skirt, black lace make it a very original model. If you're more daring, this model is for you, it is an asymmetrical cut dress with a tie and black on the chest and half white skirt and the rest of the skirt also has applications that create an interesting contrast. Another risky model strapless wedding dress with corset top and skirt type princess, takes the side of the corset and under the bust, black accents, matching gloves with the same color. Another beautiful wedding dress model is without a doubt, the following is a strapless dress with heart shaped neckline and asymmetrical cut skirt, chest and in each layer of the skirt is embroidered in black, as the gloves. 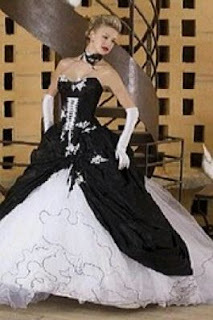 But if you've decided to give greater presence to the color black, this dress is the one, it is a strapless dress with corset and black skirt with white appliances, and below a flowing white dress with matching gloves. 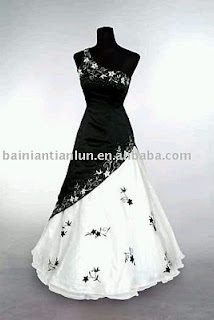 If you want something more subtle, this is a beautiful model, strapless wedding dress and low waist skirt have planks in which black colored embroidered appreciate as in the chest, complements the presentation, a small bag too black and white. Another possibility to give your white wedding dress, the black touch you are looking for, is using a belt or tie of that color, as you see in the picture. Finally, surprises everyone introducing yourself in a white dress with embroidered back and tail black, imagine the impact when they see you come in white and suddenly when they see you from behind, are given with this wonderful application.